Jane Lee is having a lot of fun. 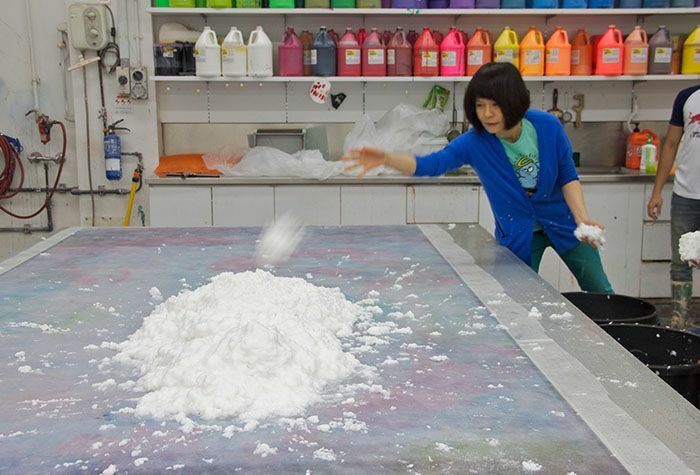 The sought-after painter, better known for her experimental work with paint as a material, is now playing with paper and discovering the printing techniques available to artists during their residency the STPI’s printmaking atelier. “I’ve never really used paper before, because my work is really mainly on the immaterial, the texture, the feeling, the tension. This [residency] is a good excuse for me to move away from painting. I’ve been painting for more of a decade and this is a nice break. And for the first time I’m using representative images in my work,” she explains while showing her works in progress. The artist has been particularly enjoying working with the STPI team. “I’ve been (used to) working alone in a studio; it’s a very lonely process, sometimes I can work on a piece for six to nine months. Here things are moving very fast, within three weeks, things have already progressed a lot,” she muses. Lee, who is preparing a solo exhibition at STPI January 2016, will offer several firsts with her works. For example, she is planning for the first time to incorporate a sound and video installation and also creating a “tree” forest for visitors using layer upon layer of color paper to create the tree trunks. “I wanted to work around a good narrative. I thought about paper, paper—tree, tree—birds. I’m exploring the idea of freedom and imprisonment using images of birds,” she told Blouin Artinfo. “I really want to fully utilize the facilities and use different techniques,” she adds, admitting that right now she has 10 different ideas on the go. One of these includes using acrylic to create cut outs of birds that will be “cascading” down in her forest, while the reversed acrylic sheets are being used to create interesting blocks of “imprisoned” birds with the artist playing with paint effects inside the blocks. “I want to give the audience a totally new experience,” she says. Lee’s work was recently shown by Sundaram Tagore at the Art Paris Art Fair and at Art Basel Hong Kong, and the Singapore artist will be showing a new piece in Venice at Palazzo Grimani in the group show Frontiers Reimagined , a collateral event during the Venice Biennale.